Show submit button option must be checked to show Add Listing button on site header bar. User have to logged in for site checking if the user are able to submit listing. If the user is able to submit listing, he will be redirected to submit page selected in Submit Listing Page option on CityBook Add-Ons settings page -> General tab. The page content must contain [listing_submit_page] shortcode. There are also important pages setting for CityBook theme properly work. So please make sure that they are correctly configuration. On submit listing page, author is able to switch between available listing types selected on author subscription’s plan post. 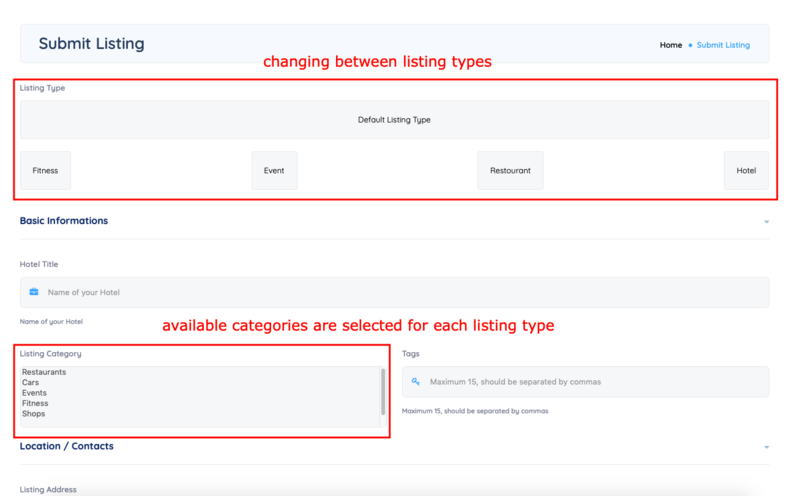 And each listing type has its own submit fields configured from Listing Types admin menu -> listing type post -> Fields tab -> Listing sub-tab. You ( site owner ) are free to add submission fields. The are also static text and image fields for giving author more details on submitting their listings. You also can add custom fields from right panel on the sub-tab screen. The fields will be displayed on listing preview card and single page by using Custom Field element. These fields are also be used in edit listing screen and WordPress add/edit listing post. When author submit listing, a listing post will be added into CityBook Listings admin menu screen with pending status post. So the listing post is not visible to everyone unless Publish Listing after paid option was checked then the submitted listing is automatically get published. Site owner can also verify and set listing as a featured listing from the screen. The submitted listing post will be expired in time in according with his membership subscription expired. There will be a notification email send to the author before listings get expired.